Oooh, you're so sweet! I've never seen it and the only magazines we can get here are hunting and cooking rags. Id love to own it, eher in Argentina we dont get such pretty magazines! word up! my magazine store hasn't had this in for a while now, i'm needing my frankie fix! thanks for the great giveaway anabela! oh hello, frankie! i can't say i've had the pleasure of hanging out with you, but i hope that is about to change! What a thoughtful giveaway idea! Scouring the city for the latest issues of Frankie and Lula has been on my weekend to-do list for the past several weeks - still no luck! They're my hands-down favorites. oh, I'd never heard of it but their website looks great. I don't think I've ever left a comment on your blog, but I always love stopping by. I always love your outfits! awh, what luck you have good magazine stores there, the ones here are terrible! I love this magazine because it's wonderful and because my family's nickname for me is Frankie! Oh fabulous!! We don't have Frankie here and I am just dying to see a real copy! I'm going to have to jump in here too. I've been looking for it since you mentioned it before and can;t seem to find it either. Oh I'd love a chance! I've never actually seen a copy yet, but have heard so many good things. ok this is really amusing because after your email i was going to come here and tell you that i dreamt about lula last night hahah. my dream was not as calm/cool though..my dream was simply about searching the book store racks, asking for help, waiting for the clerk to help me (he went away because he didn't know what it was), and then give up quickly. i did end up finding it but later realized it was an imitation lula??? who dreams these things? side note- i could see you writing for a cool magazine such as frankie, for sure. i would love to be included in this drawing even though you've already spoiled me haha. it will even out i promise..
Oh! I wish I could find this. Wow and you're giving it away? That is so sweet! And thank you for making today a little more exciting. I was looking for a copy of this the other day, but with no luck. I always enjoy reading your blog, it is very lovely! Such a great magazine! I'm sure there is somewhere around here that sells it (I hope!) but I have yet to find it. Oh, and if you do ever get the chance to visit Melbourne I can promise that you will love, love it. I would love a chance to win a copy. I can't get any decent magazines near me without a trip to the city. I have not seen Frankie but once bought Lula and loved it. I've never seen Frankie — but would love to become acquainted. Thanks for the giveaway! I've never met Frankie, but I'd like to be introduced! Oh Frankie you are so lovely. I know we will be great BFFs!! I always love a new great lead on a beautious mag! Thanks so much!! I love Frankie, whenever I hit up the "big city" I grab copies of it and RUSSH, have you read RUSSH? It has lovely fashiony collages. You're so thoughtful Anabela, dear. i'm jumping in too! i've never seen a frankie! youa re so sweet for this! I love Frankie so much I subscribed (Lula too). Luckily I'm in NZ so it's not prohibitively expensive. I already have a copy so if I'm drawn please give it to someone else! Just wanted to chime in - lovely giveaway! I honestly don't know that magazine but it looks so pretty and I never saw it in Montreal...maybe I should look tomorrow! As a young momma, ready fashion magazines has become a rare indulgence- I would love the luxury of burying myself in fashion! I have never read Frankie, and it looks like exactly what I need! I could really use a good magazine pick me up right now! I live in a medium sized town and our bookstores carry a very limited selection of international magazines. love love love frankie, though I only know it from the website! peeking out of my hole to say i'd love a chance at winning frankie. i've never heard of this magazine but it looks positively lovely! woo! throwing my straw hat into the ring. 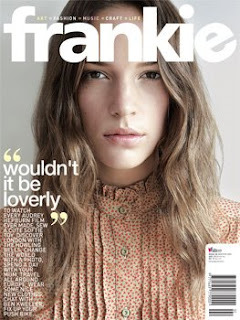 I've also always been a huge fan of Frankie- that Mia Timpano! That Benjamin Law! I've got tons of backissues of Frankie and RUSSH mags as my sis lives in Sydney and ferries them home for me every once in a while. If you've got a hankering to borrow one, let me know!